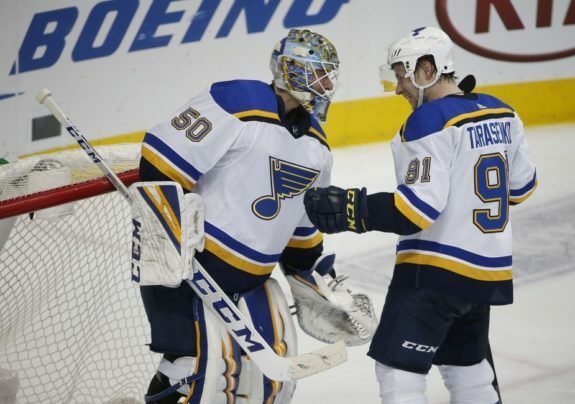 DALLAS — Rookie goalie Jordan Binnington won his third straight start, Vladimir Tarasenko scored two goals and the St. Louis Blues beat the Dallas Stars 3-1 on Saturday night. Tarasenko and Maroon scored first-period goals against Bishop, who won 3-1 at St. Louis four nights earlier. Veteran Jake Allen was in goal for the Blues in that game. Condra broke up Binnington’s chance for a second shutout, scoring his first goal with Dallas at 8:35 of the third period. Tarasenko scored on the first shot of the game, 34 seconds in, from the right faceoff circle. Maroon’s backhand from the right of the net extended the Blues’ lead to 2-0 at 9:54. Each team had 10 shots on goal in the first period. Dallas had a scoring chance midway through the second period, but Jason Spezza’s wrist shot from the top of the slot went over Binnington’s shoulder and off the crossbar. NOTES: Tarasenko has 15 career goals against Dallas. He also has seven assists for 22 points in 25 games. Over the last five seasons, he is tied with Winnipeg’s Patrik Laine for the most goals (14) vs. the Stars over the last five seasons. . Binnington was leading the AHL with a 2.08 goals against percentage when he was promoted from San Antonio. . The win improved the Blues’ record under interim coach Craig Berube to 12-12-1. . Condra was playing in his fifth game since being promoted from Texas of the AHL. His 40th NHL goal was his first since April 7, 2016. . Dallas D John Klingberg assisted on Condra’s goal and he has five points (one goal, four assists) in the last four games.